Thanks to satellite images, we've known for years now that the Arctic ice cap is shrinking. Now comes sobering, if not surprising, new evidence that shows the ice cap is thinning as well. NASA scientists who track Arctic sea ice cover from space announced Monday that this winter had the fifth lowest maximum ice extent on record. The six lowest maximum events since satellite monitoring began in 1979 have all occurred in the past six years (2004-2009), according a joint report by NASA and the NASA-supported National Snow and Ice Data Center at the University of Colorado. Sea ice thickness has been hard to measure directly, so scientists have typically used estimates of ice age to approximate its thickness. But last year a team of researchers led by Ron Kwok of NASA's Jet Propulsion Laboratory in Pasadena, Calif., produced the first map of sea ice thickness over the entire Arctic basin. Using two years of data from NASA's Ice, Cloud, and land Elevation Satellite (ICESat), Kwok's team estimated thickness and volume of the Arctic Ocean ice cover for 2005 and 2006. They found that the average winter volume of Arctic sea ice contained enough water to fill Lake Michigan and Lake Superior combined. The older, thicker sea ice is declining and is being replaced with newer, thinner ice that is more vulnerable to summer melt, according to Kwok. His team found that seasonal sea ice averages about 6 feet in thickness, while ice that had lasted through more than one summer averages about 9 feet, though it can grow much thicker in some locations near the coast. "Ice extent is an important measure of the health of the Arctic, but it only gives us a two-dimensional view of the ice cover," said Walter Meier, research scientist at the center and the University of Colorado, Boulder, in a NASA press release. "Thickness is important, especially in the winter, because it is the best overall indicator of the health of the ice cover. As the ice cover in the Arctic grows thinner, it grows more vulnerable to melting in the summer." The report comes as the privately funded $4.3 million Catlin Arctic Survey, a three-month, 621-mile expedition by three British explorers, journeys to the North Pole to measure the thickness of the polar ice cap. Their findings will be presented at the United Nations Climate Change Conference in Copenhagen, Denmark, in December. $4.3 Million for three months... dang... I'll go. Just ask a mammoth... climates change... even without man helping! We human being are our own worst enemies. We disrespect our "Free" air and water and its environments. Now we are the frogs in the slow cooker dying without caring and knowing. We deserve to die because human being just care about making money and showing off with all the garbage we created. Warmest year was 1934 - no more Greenland forest in this interglacial ? "Ice extent is an important measure of the health of the Arctic"
Ice Bears will have to seek Grizzly Bears as mates ? That's not so hard to figure since abnormal low was in 2007. That's 2 years for ice to grow, so all that open water in 2007 that is now ice will be, let me guess, less than 2 years old. Hey, I could be an ice guru for NSIDC. BYW, they couldn't make a headline about ice extent, because it is doing "ver well" thank you, so they have to look for the thinning headline. The Arctic is fine, polar bears are fine, Anthropogenic CO2 induced warming is a miniscule factor that is exaggerated into a hoax, and that could mean some folks are worried about their Government funding, so better come up with a different exaggerated headline to keep our gravy train going. If this planet has been here for 12 billion years do we know how many times it has gone through a climate change and what caused the changes, other than a meteorite or volcanic eruption? I'am not so sure we are the "only one" causing the change. they learned how to do this in the past year...but now are telling us how thick the ice has been for the past milenia? Can't we just do some sort of snow and ice comb-over? If we then just act natural, hopefully no other planet will notice. Is this the same Arctic ice thinning reportedly caused by wind blowing the thicker ice to lower latitudes where it melted? And did the researchers include all the ice this time, unlike the last time when the left out ice covering an area the size of Texas due to a bad sensor? Hang in there... we always have an end of world senerio going... and someone getting rich off filling you with fear... bit of advice... don't send Gore too much of your money... he doesn't really need it with his multiple mansions, 727 Jumbo Jet, 15 Cars etc... he's not too worried about his cabon footprint does he? Climate change happens naturally. It gets warmer, then it gets colder. There is a science called paleoclimatology that explains & documents these changes. During the Medieval Warming Period it was some 2 degrees warmer than now, and you know what, the world and humans survived by adapting. Same for the Little Ice Age that followed. Man can't stop climate change or even diminish it. Man can't stop a rainstorm; can't stop hail; can't stop snow; can't stop a hurricane; and etc. But we're going to stop (mitigate) climate change! Sure we are. You all are a bunch of morons! Global warming is real. 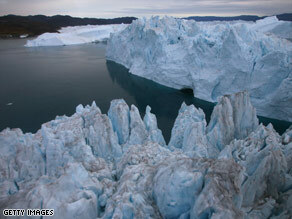 The ice cap is melting and shrinking. It poses some serious problems for our planet. If you can't see or understand this, stop reading your Bible and pick up a science book. the idea that life can live on this planet without haveing an effect is a farce and a lie by the people that want to control how we live. the only way to minimize it is population reduction…which i have heard them talk about….we should start with those that want this done. I read my Bible and my science books. Read the description of Revelations with global warming in mind. Yes, it does fit the description. It would also fit with God's justice. We end up into a massive destruction before the Lord's second coming due to our own pride and ignorance and destruction of our planet. I am a creationist and an evolutionist. If you aren't Charles Dawkins, there's no conflict at all between the two. This so called divide between science and God is due to a small lunatic fringe on both sides. We need to unite against our true enemy – Exxon! Hey Liz, What caused the ice that covered all of what is now Canada and the Northern States of what is now the United States to melt? Were the prehistoric Clovis People burning too much fuel and creating too much CO2 to keep warm? The planet cools and warms in cycles just as everything else in nature. To those that are skeptical and say this has happened so many times before...true. And that man has survived it in the past, also true. The part you are missing is the size of the population. Now, the climate change is affecting the largest populations in Earth's history. There is never any attempt being made to stabilize the population like they did in the 60's. Will man survive these changes, maybe, but how many will be left? Seems a pity that so many need to perish so we can drive our big SUV's, don't you think? If the caps are melting and it's part of either a natural warming trend for the planet or man-made CO2 emissions – It's far too late to stop it. IF it IS a natural trend based on some solar cycle or other mechanism – nothing humans can do will stop it. IF it IS a human borne problem with gas emissions – think about this – you have BILLIONS of former 3rd world countries sweat shopping their way into the 21st century with the rest of us... Do you think they give a hill of beans about global warming when they get their first refrigerator? (Incidentally still using the "ozone killer" R12) OR get to drive one of our beloved automobiles like us schmoes here? No. We are now wired to move forward and no one is going to change their tune until the effects of the change (already in progress) impact them in some tangible negative way. Nature will adjust – let's just hope we can. Let's see.......in the last 250 yrs. the population of the world has???? Not doubled, not tripled..... think about it..... we are a virus that's out of control.....eating away everything in our path!! It's really time to wake up and realize we're not as smart as we think we are. 1 planet.....a future or not????? It's up to us to manage it the right way. The human race is like a locust, swarming the planet, consuming everything it can, and through away the rest. Steven Hawkins is right. One day we will have to move on to other planets to survive. We can't control mother nature, she is controlling us. The only thing we have control over is how much garbage we put in the water and air. This "green" thing is marketing at it's best, and the government is not telling us everything we should know, in more ways than one. Yes, but why doesn't the article state that April 2009 had record breaking arctic sea ice extent. Tell the rest of the story. His hairstyle and ltegnh of hair on video of interview and at the time he got passport is the same. So is his dress, same shirt, same necktie. I would guess the video was made on the same day.